Online registration for this event is closed. You may register on Friday, January 18 from 11:00AM-1:00PM at the BGI at the City Market in downtown, Indianapolis. Or, on race morning at the OneAmerica Tower from 9:00AM-11:30AM. Team Captains - Provide your transaction number from your confirmation email to your team members so they can Join You Team! Participants will receive a Long Sleeve T-shirt upon finishing. But first, you have to BOP to the TOP! Shirts are NOT guaranteed to those that register after Wednesday, January 16 at 11:59pm! Be sure to pre-register before then! Seed times will be posted on Friday, January 18. If you do not wish to be seeded, or do not enter a seed time, you will be placed between 10:30am - 12:00pm. Bop to the Top is proud to support Riley Children's Foundation! In the 35 year history of this event, Tuxedo Brothers has raised over $750,000 for this wonderful cause! For 2019, we have set our fundraising goal to $15,000! If you are interested in collecting donations for Riley Children's Foundation, you can set up a personal or corporate fundraising page. Collect donations from your friends, family or co-workers by creating an online giving page HERE.. The Riley Children's Foundation receives 100% of funds raised by individuals and teams who set up fundraising pages, so please consider the difference you can make in a child's life! You can also bring your donations to the event site on January 19th. If you bring cash or checks, please fill out and bring the pledge form below with you on January 19. Bopping to the Top in 2019 will be Aiden Hunter. Aiden, who is a freshman at Zionsville Middle School, was recently named a Riley Champion. After spending 32 days at Riley Hospital for Children, he has made a full recovery. Click here to read Aiden’s blog. You can also help Aiden reach his fundraising goal of $500 by clicking here. 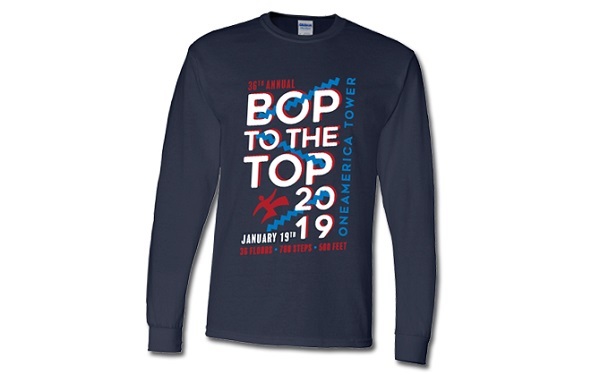 Volunteer at Bop to the Top! Enjoy the exciting atmosphere of Bop to the Top without having to climb a single step! All volunteers will receive an event shirt, free parking, and refreshments! If you're interested, register as a volunteer by clicking on the red Volunteer tab at the top of this page. If you have any questions you can check out the event page www.tuxbro.com or e-mail us at Jason@TuxBro.com! When this page loaded, the official time was 4:26:06 PM EDT.